This series was inspired by a photograph of the back of a Francis Bacon painting. 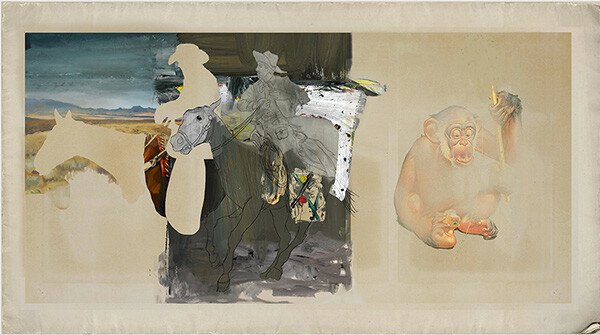 He was infamous for working directly o t n unprimed canvas, creating ghost images of the front as the turpentine saturated the canvas and bled through. 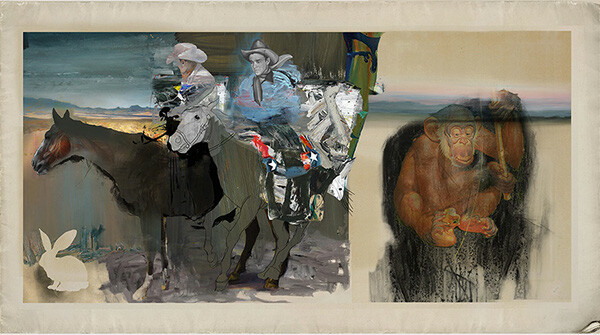 The Two Frontier series was originally approached as a triptych (congruent with the Bacon original), as evidenced by the degree of completion within what would have been the three compartments. The center panel was the first area dealt with, the left portion the second. This gallery focuses on the evolution of that panel. I frequently focus on a singular area until I feel it is evolved enough to stand on its own before moving on to the next area. A great example of this would be the JFK Transformations, which focuses on the changes that occurred while attending to the portrait of the president. It is worth noting that the monkey which is visible in what would be the right panel speaks directly to the Napoleon Monkey series. It will be the area dealt with. As the left panel was worked on the monkey appeared and disappeared, functioning as a note to keep me oriented to right panels mass. 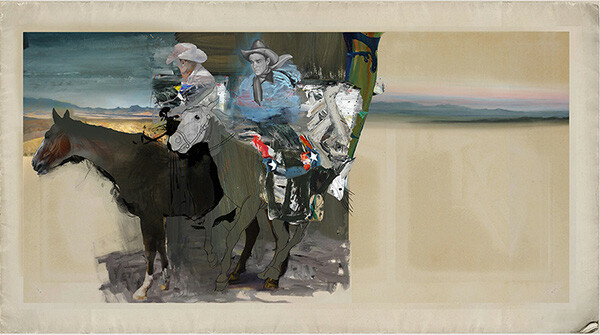 The works produced as Rauschenberg Jr.addresses some of the fundamental questions presented by our post modern / late consumerism culture including image acquisitions, visual property rights, reconstitution and transmutation of image sets.